When one thinks of Russia, the iconic Kremlin and Red Square in Moscow to the Bolshoi ballet and the James Bond classic film From Russia With Love spring to mind. Underneath our hazy, romanticized perception of Russian life, however, lays a stifling environment that threatens the ability for LGBT people to assemble publicly. This is a reality with which activist Nikolai Alekseev is all too familiar. As one of the country’s most prominent LGBT organizers and founder of GayRussia.ru, Alekseev has been on the front line of efforts to organize Moscow Pride since 2005. Locking horns with then-Mayor Yuri Luzhkov, who has condemned Pride events as "Satanic" and part of "a deadly moral poison for children," Alekseev and other organizers have seen their demonstrations banned every year. Activists-including British activist Peter Tatchell and Andy Thayer of the Gay Liberation Network-have also faced violent attacks from anti-gay rioters and arrests during their attempts to organize. Alekseev himself has been detained under mysterious circumstances, most recently in a Russian airport late last year. Such news may be surprising to some gay Americans who have grown accustomed to this country’s raucous Pride season, but international pressure against Russia has increased. The European Court of Human Rights ruled last October that the Russian government had violated LGBT activists’ right to assemble peacefully in Pride events. Nevertheless, the government has appealed the court’s decision and Moscow’s newly appointed mayor, Sergei Sobyanin, has said he would also oppose the event. With the organizers’ latest attempt to hold a Pride demonstration set to take place May 28, Alekseev, 33, has launched a series of seven speaking engagements across the United States with the hopes of spurring on further awareness of the discrimination LGBT Russians face. The tour begins on Saturday, Feb. 26, in Chicago. And it will continue with stops in New York, Texas and California through the beginning of March. LGBT Russians’ difficulties in holding peaceful Pride events are indicative of much larger human rights concerns they and other groups endure there, Alekseev told EDGE in an exclusive interview. While he anticipated the European Court of Human Rights will not accept the Russian government’s appeal, he said their opinion won’t change Sobyanin’s mind. "In general, I don’t expect the Council of Europe to send the tanks to Moscow to make this Country finally respect the European Convention it ratified itself," he said. "But when you think about human rights in Russia, don’t think only about Gay Pride. Think about crimes in Chechnya, think about the invasion of Georgia, think about journalists being killed, think about opponents being jailed." 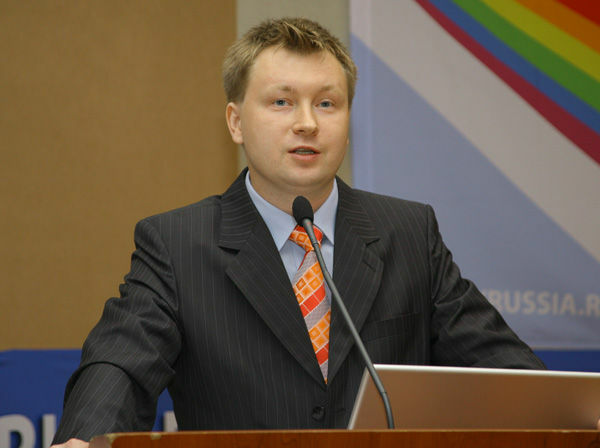 Alekseev’s foray into activism began in late 2001. While pursuing a post-graduate degree at Moscow State University, he attempted to submit a thesis on the discrimination LGBT Russians face. The university rejected Alekseev’s thesis on the basis of its subject matter. While homosexuality has been legal in Russia since 1993, the majority of Russians-one 2010 poll indicated 74 percent-considers it to be an either "morally dissolute" or mentally defective condition. Such widespread opposition has not made it easy for Alekseev, who said he regularly receives threats of violence. But he has chosen to go forward with the cause and said he will not back down with his demands, even when other queer Russian activists criticize him as too aggressive. "Like many others everywhere in the world, I know that the path I follow is not the safest," said Alekseev. "Those who know me a bit know that I am a boiling personality. I can’t stand injustice. I can’t stand hypocrisy. I am a very demanding person, as much as from my enemies than from my close friends. Don’t promise me something you cannot give me. Don’t tell me yes if finally you don’t deliver." While admitting that many Western LGBT people are not well-informed about the queer Russian struggle, he described their challenges as only "a drop in the ocean" of the problems facing many groups of people around the world. Alekseev has a deeper issue with the lack of American diplomatic response to abuses of power that have taken place on Russian soil. He said neither Secretary of State Hillary Clinton nor President Obama have acknowledged LGBT Russians’ plight. And Clinton’s omission of LGBT issues when she inaugurated a statue of American gay poet Walt Whitman at Moscow State University in Oct. 2009 struck Alekseev as particularly bizarre. "It took place on the same square where we were all arrested for trying to stage our Pride just three weeks before," noted Alekseev. "The U.S. embassy could not ignore it. A U.S. citizen was arrested as well. How many people in America complained about that? How many people in America wrote to Clinton to tell her that this behavior is totally unacceptable for someone who shouted everywhere that she supports gay rights." Obama’s meeting with human rights activists in July 2009 also neglected to mention the country’s gays and lesbians. "We were completely excluded from the meeting that he had with human rights activists," added Alekseev. "What does that mean? Gay rights are not human rights? Well, that’s the message that Obama gave in Russia." Rather than asking for solidarity or money from LGBT Americans, Alekseev said he hoped broader awareness of queer Russian activists’ plight will help to encourage them to respond to human rights abuses that continue to take place around the world. "I don’t think it’s about expressing solidarity with Russians," he said. "I think it’s about standing up regularly for all those who need support. It’s about being less self -centered. It’s about taking some of your time and trying to make a change either by supporting activists in the field, by going and meeting them or raising support, doing actions or asking the government to move and to include such issues in the foreign diplomacy." Log onto www.gayliberation.net for more information on Alekseev’s upcoming tour.